Yuriokis Gamboa (28-2 17kos) a four-time world champion in three weight divisions and an Olympic gold medalist from Guantanamo, Cuba will be taking on Miguel Beltran Jr.(33-6 22Kos) Saturday Nov 10th. Boxing Insider – How do you feel about the fight this Saturday? Boxing Insider – looking past this fight, say you get through this fight with Beltran, what else would you like to accomplish? Gamboa – Well to continue going forward with my career and to retain another championship belt like we have in the past. Boxing Insider -In your division there is a lot of big names, a lot of talent in the surrounding weight classes like Gervonta Davis there’s also Lomachenko. How do you feel you would match up to names like these? 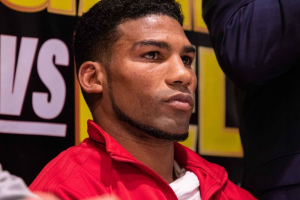 Gamboa – I’m basically in a weight class where that question makes no sense. There is nothing different, nothing new. Nothing that I haven’t already accomplished for someone in your case to be asking me that question. Boxing Insider – In boxing, it is believed one ages rather quick. You’re almost 37 years old. How much more do you think you have left to give to the sport? Gamboa – I can’t say exactly. Only god knows what he has planned for me. Boxing Insider – You have had a magnificent career both amateur and professional. There was lot of potential for you to accomplish a lot more in the pros. What do you think prevented you from achieving that? Gamboa – Well definitely the inactivity. We haven’t had much opportunity to fight therefor not much opportunity to win. That is the main reason. Boxing Insider – Is there any last words you’d like to say to your fans? Gamboa – Just want to say thank you to all the fans and to continue following my career. Come Saturday night we are going to demonstrate that we are still able to continue giving you guys exciting performances. Gamboa vs. Beltran will be live on Pay Per view beginning at 9 pm ET / 6 pm PT. Juan Manuel Lopez (35-6 32kos) will also be on the card taking on Cristian Mino (19-2 17kos). Tune in for another exciting night of boxing!